Highland Gardens: This property is an excellent choice for the first time home buyer or the retiree. It is affordable and features 2 bedrooms and 2 baths. The bright and cheery kitchen with new range, large breakfast bar and pantry. There is a living room on one side of the kitchen and a dining/family gathering room on the other side of the kitchen. 15 X 12 screened lanai is great when more room is needed. Interior has been freshly painted. Beacon Square: Simplified, Easy, Lifestyle Found! Easily Financed! Garden Apartment Located In Beautiful Beacon Square, 55 & Better Community Is Designated "Single Family Home" By Lee County, Allowing Both FHA & VA Loan Possibilities Minimizing Cash To Purchase. New A/C, & A New Roof Scheduled And Budgeted, Tastefully Renovated Home Is A Tremendous Investment Opportunity. Split Floor Plan Featuring 2 Bed & 2 Bath, Interior Laundry W/New Front Load Washer & Dryer. Kitchen W/Beautiful New Cabinetry, Island, Granite, Tile & Glass Backsplash, JennAir Stainless Steel Appliance Package Including Pots & Pans! Wood Plank Tiled, W/Beautiful Complimentary Slate Tile On Under Truss Screened Lanai, Through 2 Sets Of Sliders. Additional Patio Living W/Fence Section Privacy & Outdoor Storage Closet. Owner's Suite Is Roomy & Bright W/Walk In Closet & Private Spa Like En Suite Featuring Glass Tile Accents, Glass Doors & Beautiful Sink Cabinetry. Beacon Square Is Delightful Oasis Tucked Into Central Lehigh W/Mature & Well Maintained Landscaping, Heated Community Pool W/Cabana Style Outdoor Entertaining. Minutes to Shopping, Dining, Churches, & Professional Offices, Your Opportunity For Affordable "Like New" Home! Golden Lakes: SPACIOUS VILLA, FULL 2/2 , ALL CERAMIC TILED FLOORS INCLUDING PATIO. PATIO TOTAL REDONE IN O5' ENCLOSED W/ VINYL SLIDER WINDOWS & A BEAUTIFUL WATER VIEW ! WALK IN SHOWERS , IN BOTH BATHS & BOTH HAVE NEW TOILETS , VANITIES, & LTS. ALL FRESHLY PAINTED, 2019 & NEW WASHER & DRYER ,2018. NEW GARBAGE DISPOSAL IN KITCHEN. ACCORDION SHUTTERS ON ALL WINDOWS & INCLUDING PATIO DOOR. LOTS TO LOVE WITH THIS ONE ! GUARD GATED COMMUNITY, MANY AMENITIES & ACTIVITIES GALORE! THERE ARE TWO CLUBHSES, ,POOLS, SPA HOT TUBS, GYMS , CAFES FOR BREAKFAST & LUNCH. TWO SOCIAL DIRECTORS TO KEEP YOU BUSY & HAVING FUN ! LOCATED CLOSE TO SHOPPING, RESTAURANTS & TURNPIKE ! AIRPORT & OCEAN A SHORT DRIVE AWAY ALSO ! PARADISE AWAITS !! Ibis: Looking for a place for Long Weekends and Great Golf? For Less than $200,000 you've found it! IF NEEDED OWNER WILL CONSIDER CREATIVE FINANCING FOR THE $90,000 MEMBERSHIP! Enjoy the Ibis lifestyle which includes 3 Fabulous Nicklous designed golf courses, 4 dining facilities, recently updated and enlarged clubhouse, Har-tru tennis courts, state of the art workout facilities, pickleball, bocce ball and more! Be warned, you will love it so much you might just want to stay year round! Enjoy the lake view, especially in the evening when the birds come to roost for the night in the trees across the lake. Membership is mandatory with the seller requiring the purchase of a Premier Golf Membership priced at $90,000. No showings until March 1. Bedroom 3 is a den. Golden Lakes: UNIQUE END VILLA, QUIET CUL DE SAC, SHORT WALK TO LK CAROL POOL. SPACIOUS SPLIT FLOOR PLAN, ALL CERAMIC TILED FLOORS. FORMAL DINING ROOM, TALL PANEL WINDOWS IN MASTER BEDROOM. ALL LT & BRIGHT WITH BEAUTIFUL WATER VIEW ! . HAS LARGE GLASS ENCLOSED PATIO WITH HUGE UTILITY CLOSET, LOTS OF STORAGE. THIS VILLA YOU CAN UPDATE TO YOUR TASTE !GUARD GATED 55+ COMMUNITY, LOTS OF AMENITIES, 2 CLUBHSES, POOLS, SPA HOT TUBS, GYMS, CAFES FOR BREAKFAST & LUNCH, TENNIS, ETC. TWO SOCIAL DIRECTORS TO KEEP YOU BUSY WITH MANY ACTIVITIES. LOCATED CLOSE TO SHOPPING RESTAURANTS & TURNPIKE ! AIRPORT & OCEAN A SHORT DRIVE AWAY ALSO ! PARADISE AWAITS ! High Point Of Delray: SPACIOUS & BRIGHT 1 BEDROOM 1.5 BATH VILLA IN DELRAY HIGH POINT SECTION 2. COMPLETELY REMODELED WITH A BEAUTIFUL OPEN CONCEPT KITCHEN. TILE THROUGHOUT. CROWN MOLDING UPDATED BATHROOMS. NEWER WINDOWS AND SHUTTERS. FRENCH DOORS TO SUNROOM (WITH A/C) CAN BE USED AS GUEST ROOM/OFFICE. 2 LARGE WALKIN CLOSETS IN MASTER BEDROOM. GREAT LOCATION!!! CENTRALLY LOCATED NEAR SHOPPING, RESTAURANTS, DOWNTOWN & MINUTES TO BEACHES. TRULY A MUST SEE!! Aberdeen: When you enter this lovely home, you will notice how open and bright it is. The sliding glass doors have been removed from the A/C lanai, opening up the entire area and giving you the additional 280 sq ft of living space not indicated on tax roll. It is a true 3 Bedroom 2 Bath home. You have a garden view with no rear neighbors. The house comes equipped with central vac, water heater replaced in 2012 and a Train a/c replaced in 2003. The home is tiled with carpet in the bedrooms. The eat in kitchen has a newer SS refrigerator. Range and microwave have also been replaced. Hampton is an all age community. $22,500 app fee, $7,500 social equity, $3,000 initiation fee. $12,000 annual dues. $1,000 capitol contribution due to HOA at closing. High Point: RARELY AVAILABLE 1 BR, 2 BTH VILLA with an UPSTAIRS LOFT and a WASHER & DRYER inside the unit. This updated home has VAULTED CEILINGS and skylights, creating wonderful light and spaciousness. The 12' x 8' upstairs loft is perfect as an office or bedroom for visiting guests, and has A/C vents. There are kitchen updates, a BRAND NEW ROOF, 2017 A/C (2.5 ton), and updated flooring. The FENCED-IN FRONT PATIO and no neighbors in the back are an added plus. This active 55+ community has a clubhouse, large heated pool area, tennis courts, a gym, activities and more. HOA fees cover WATER, CABLE, ROOF and more! Located within a 5 mile radius of amazing restaurants, shops, a thriving nightlife, boating on the Intracoastal, and Delray's exquisite BEACH! Kings Point: Beautifully renovated 2 bedroom, 2 bath villa in Kings Point, a centrally located, active adult community. Well-appointed Chef's kitchen with updated cabinets, marble countertops, glass tiled backsplash, brand-new stainless steel appliances, a snack bar, a breakfast nook and a gorgeous custom ceiling. Master retreat with a large walk-in closet and an en-suite bath. Neutral tile, a bonus room and an abundance of natural light complete this home. Enjoy peace and tranquility on your enclosed patio with a stunning direct lake view. Kings Point offers first class amenities which include a clubhouse with a theater, a fitness center, cafe, resort style pool, resistance pool, Har-Tru tennis courts, Bocce courts, shuffleboard and two 18-hole golf courses. Golden Lakes: Lovely 2 Bedroom/2 Bath Villa, with a covered screened entry, includes a One Year HOME WARRANTY. Completely tiled throughout. Both bedrooms have walk in closets. Granite countertops in kitchen. Washer/Dryer. Mail is delivered right to your door in this unit. Well maintained Trane A/C. Tankless Water Heater. All furnishings included. A BRAND NEW ROOF was put on this unit March 2019. This unit comes with an additional storage locker in the community storage room. Golden Lakes is an active 55+ community offering year round activities. Full time social director on site. Pools, Jacuzzis, Tennis, Saunas, Gym, Card Room, Auditorium, Billiard Rooms, Library, shows, charter buses to off site activities. Close to everything. Come enjoy your new lifestyle!! Aberdeen: This wonderful villa has a serene setting with a beautiful lake view in the 55+ section of Brittany Lakes/Aberdeen. This light and bright home has 2 Bedrooms, 2 Baths, PLUS a den. The open and spacious floorpan has nice tile throughout the living areas. Enjoy the eat-in breakfast area in the kitchen while looking at a tranquil setting of a lake. Master bath has dual sinks, separate tub and shower, and water closet. The Florida room has A/C but sliders can be opened for the nice lake breezes. Inside laundry room. Brittany Lakes has a satellite pool area. You are not just buying a villa...but a fabulous life style in Aberdeen Golf and Country Club. Membership is mandatory but offers a choice of different memberships for your own lifestyle. Golden Lakes: OH...what a view from the newly installed enclosed covered patio. A full length waterview to enjoy your morning coffee from. Clean, light and bright 2 Bedroom, 2 Bath villa corner unit that has extra windows on the side of the unit. Master bedroom has an enormous walk in closet. Newer vanities in both baths. New shower doors in 2nd bath. Completely tiled. This unit is just steps from the Lake Carol satellite pool. A/C 3/2016. W/H 6/2008. Golden Lakes is an active 55+ community offering year round activities. Full time social director on site. Pools, jacuzzis, tennis, card rooms, billiard room, computer room, library, cafe, saunas, gym, shows, and much more. SELLER SAYS MAKE AN OFFER! Ibis: SELLER IS VERY MOTIVATED TO SELL IT FASTER/TURNKEY FOR RELOCATION!Lovely Villa and Brightful 2BR/2BA (or 1Master Suite BR plus Den/1BA) home. Modern Furniture. Property is being 'Sold As-Is' without any guarantee or guarantee by seller. All in one floor, high ceilings, brick paver courtyard, New fridge in an upgraded Eat In Kitchen that gives a magnificient view into the living space and the private Patio. There is a private Laundry Area. ALTHOUGH IT HAS ONE CAR GARAGE ATTACHED, THE GOLF CART FITS VERY WELL AND THE HOUSE HAS MANY STORAGE FACILITIES INSIDE! Hurry Up and SEND your OFFER NOW! 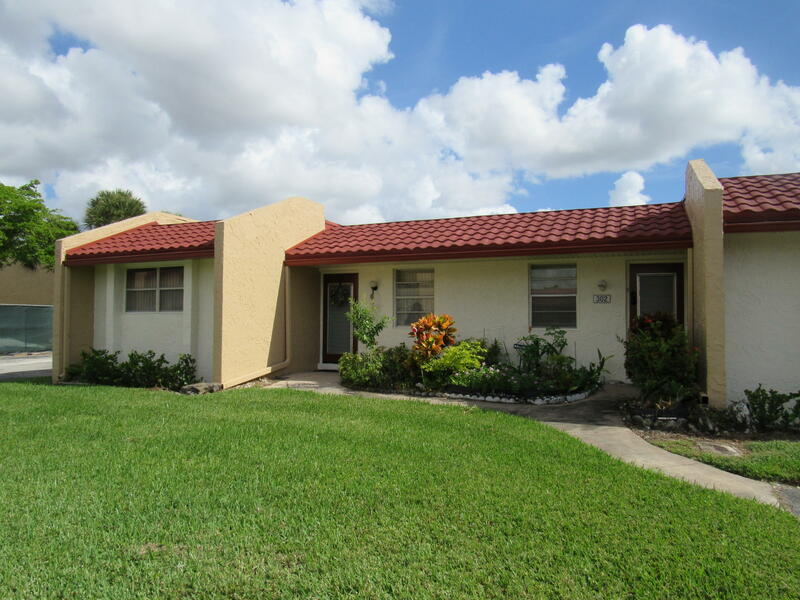 Corner lot villa in a great location Villa in Boynton Beach. This is a 55+ community. Property needs kitchen, flooring, and some repairs.